Several years ago I got in different lots a Twist n Turn Japan body (from 1967) and in another one the right head. I restored the doll down to her waist but the legs of the body had bite marks and the joint was coming out of the knee. In the last weeks I was lucky enough to find the right body with good legs. So in the next weeks I can finally finish a repair project that lasted several years. It’s good to know that my search has come to an end. 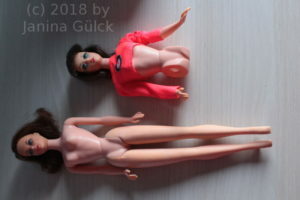 I will tape how to clean the MOD Barbie and how to do the rest that two dolls become one. 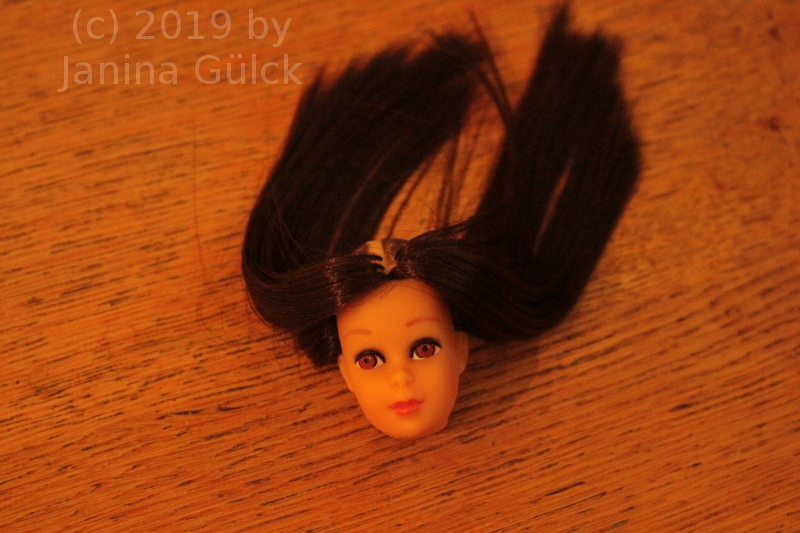 Have you ever asked yourself what kind of material they used for Barbie hair? I did ask myself this question years ago and I found the answer. The answer is not so easy to explain. The material changed within the years. 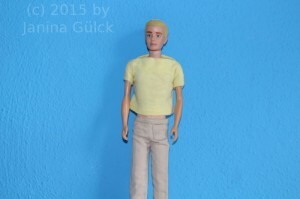 I’m not 100% sure but I think the early Barbie( 1959 – 1984?) dolls had Saran hair only. 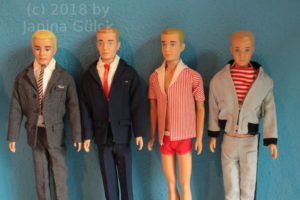 Some of the early Barbie dolls and their friends have the problem that the hair feeling is similar to straw. Maybe they changed the composition of materials within the decades? Anyway, nowadays you can buy Saran hair, Nylon hair and Kanekalon hair ( used from the late 1980s on ). You can see Saran on the right and Nylon on the left. Nylon hair was used for the Rockers and Rockstar series in the mid 1980s. 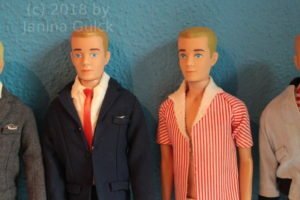 I assume there are more Barbie dolls with Nylon hair but I don’t have all of them so that I can look it up. Nylon hair is much shinier than Saran hair. Saran hair is available in natural colours like blond, brunette, titian and black. The main difference is the effort to style it. Nylon hair is easy to style. Just one hot water treatment and the job is done. For Saran you need more effort. It’s not so easy to bring it in any form you want it to. It has a kind own character. 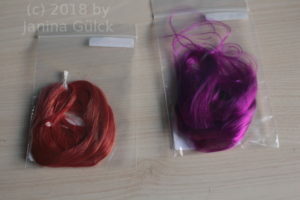 The third material is Kanekalon hair. Kanekalon was first seen in the late 1980s and has a feeling like wadding. It’s also called wadding hair among collectors. It was mainly used for the 1990s dolls with massive amounts of hair like Totally Hair Barbie or Jewel Hair Barbie. I assume the reason they used it is the price. Saran is more expensive. Hollywood Hair on the other hand has Saran hair. Kanekalon hair tends to tangles. You think you have all tangles out and bang new ones are in. No problems for collectors but for children a real nightmare. Kanekalon was widely used for Barbie dolls in the 1990s. Ski Fun Barbie & Midge, Paint n Dazzle Barbie and many more had Kanekalon hair. There are a few exceptions like the Strolling Fun Barbie & Kelly. 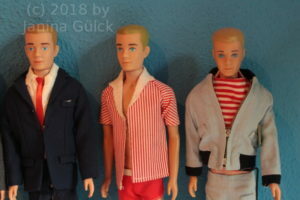 While writing this post I think of another collector who told that she wanted to repair a Talking Barbie doll (from 1967, the ones with the pull string in the back) but had no idea how to do it. She had no instruction, no parts for the repair itself and wanted every information for free. I gave her the advice not to repair the doll until she knows exactly what to do. Later I got a message that she had opened the body but the parts were flying around. This made me think. Maybe I’m overorganized but I study instructions how to repair things and order replacement parts before I do anything. Although the repair itself is not hard, the reassembly is a bit tricky. You have to test before you glue everything in, you need the right kind of glue. No, you can’t use every glue. You need to know about the material of the body. When I give this advice to anybody I know why I do it. You also need a bit of technical understanding and manual skills. 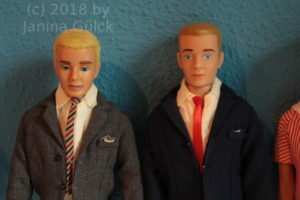 I have repaired several Talking Barbie dolls and I know what I’m talking about. Here’s the last one I repaired. I heard from other collectors with no instruction that they didn’t manage it. Why did I neglect my blog in the last months? I like to talk about my collection. I have been a collector for more than 20 years now and I collect what I like. Collecting is a very personal thing. You always have things that you like and things you don’t do. Some time ago I tried to expand my possibilities. With photos you can’t show everything. 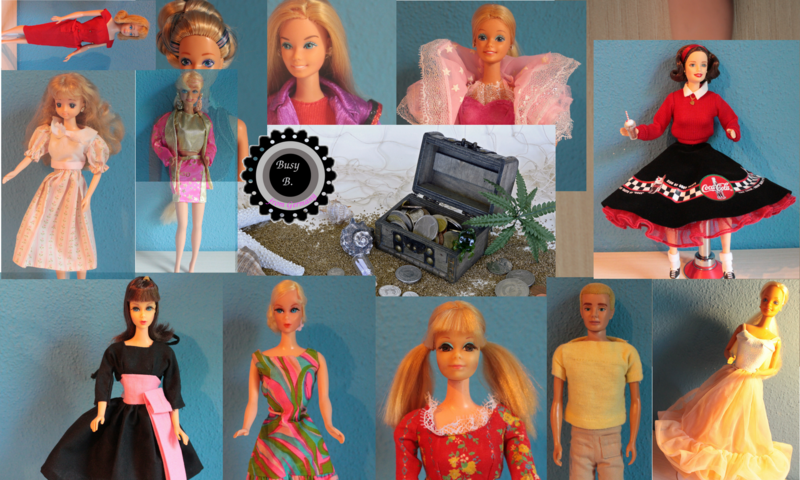 I taught myself to be a Barbie doc and like to show other collectors how to – manuals. Some things are really easy. You can do them yourself but how can you document these ideas with pics? Just leave a comment in my videos if you want specific topics. Here is my latest OOAK -Project. I reflocked another Ken. 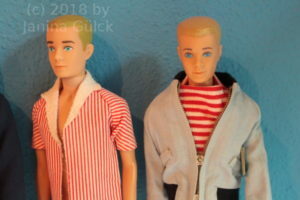 I didn’t take any pics of my first Ken but this time I took pics. 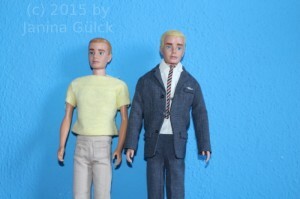 The Ken was totally bold and had no flocking material on his head anymore. I think the original colour changed a bit and became darker within the decades since he was produced. and now they look like twins.